Yesterday was an oddly busy mail day, I guess stuff stacked up over the weekend... here's what came in from Uncle Sam's delivery service yesterday! So, the two J.D. Martinez cards leave me with just the /99 of card UAJR-JM2 to complete the rainbow! How awesome is that? I promise, once I hunt down the LEAST RARE card from this rainbow, there'll be a full post showing off the awesome full rainbow. Why a Jedd Gyorko? I'm sure that's a question that has haunted many. Well, because it came in a lot with the Cosart /125! So, any of you Padres fan want to swap an Astro for this Gyorko? *Crickets* Bueller? Bueller? 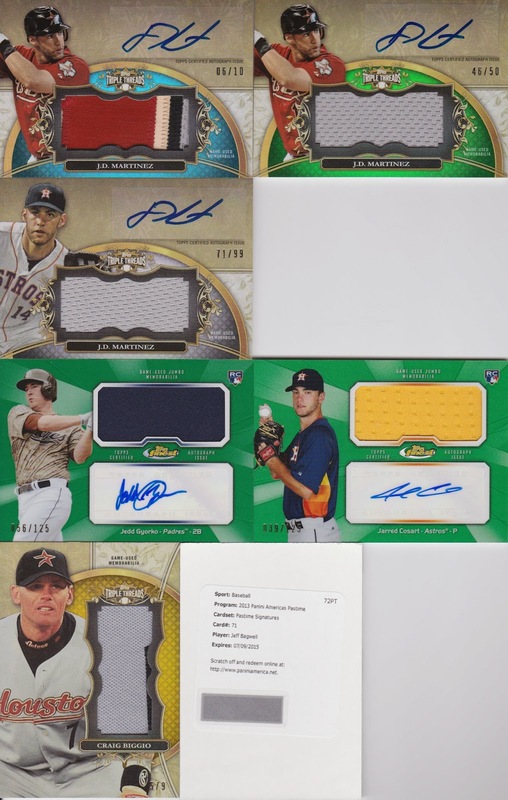 On the Biggio, it's /9 and you can see just the hint of a patch on the right hand side! Finally, the Bagwell redemption. Hopefully Jeff signs these and I get to add a rare Bagwell to my collection. He doesn't sign a whole lot, so a lot of his autos that are on eBay don't come cheap. This one did though, I'm guessing because it was a redemption. I have never received a panini redemption, still waiting for a few. Really hope that Bagwell comes through for you ! Mixed up in JayBarkerFan's Randomizer?